If you weren’t a morning person before, now might be a good time to start. Long rife with killer Benedicts and flapjacks, L.A. has become the place to fuel up with savory Asian porridges and fresh Mediterranean mezes. Flavorful, nutrient-packed bowls of sustenance are the new egg whites and grapefruit. You can splurge, too, with drippy, biscuit-bound concoctions that taste as good as they look on Instagram. Like an edible mantra, breakfast sets our intention for the day. Will you be healthful, indulgent, or adventurous? After all, you are what you eat. For all our enthusiasm over shareable small plates and family-style dining, breakfast is still a pretty territorial meal. That’s my oatmeal, my breakfast burrito, my bagel. Around the eastern edges of the Mediterranean, though, the breakfast table is a gathering place, and morning brings a feast of spiced stews, salty cheeses and yogurts, pickled vegetables, and warm flatbreads of all shapes and sizes. This is the spirit Sara Kramer and Sarah Hymanson are trying to capture at Kismet, their all-day restaurant in East Hollywood. “Both of us are pickers,” says Hymanson. 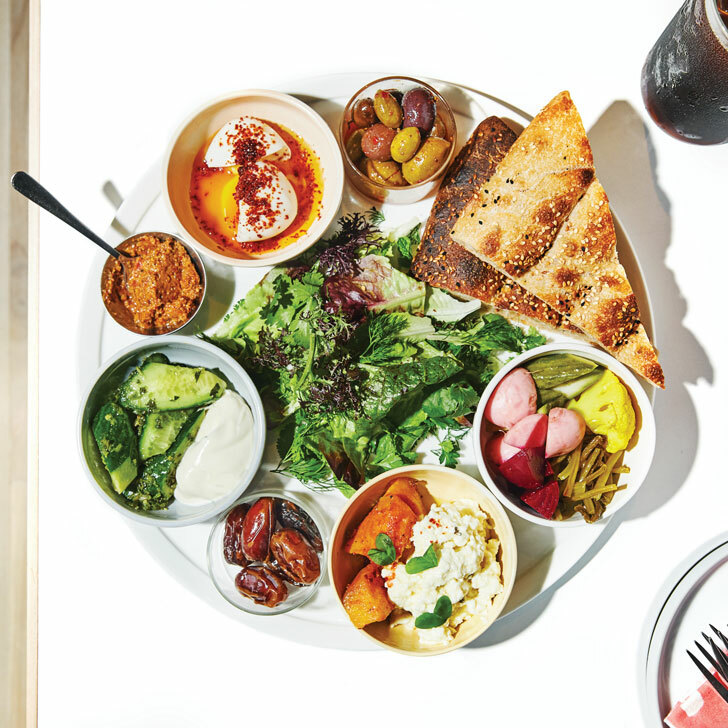 “We love lots of little things.” Their “Turkish-ish Breakfast” features noshes such as fresh dates, marinated cucumbers, and house-made labneh. “We want breakfast to feel like a celebration,” says Hymanson. It’s easy to be festive over Kismet’s bubbling cauldrons of tomato-and-egg shakshouka—the breakfast burrito of 2017. Sure, this kind of food makes for a more jolting start than, say, Cheerios, but nothing beats morning breath like garlic. Break from the morning grind with Kismet’s iced Turkish coffee: Turkish coffee has one of those instantly recognizable aromas—like pot, or the baking bread at Subway. Meant to be savored, the fragrant, gritty, viscous pour is made from Turkish arabica beans that are pulverized into an ultrafine powder and spooned into a wide-bottomed copper pot, called a cezve. Water, sugar, and spices—most commonly cardamom—are added and brought to a boil, and the resulting elixir is served in a demitasse with a crown of dark foam. Kismet puts a weather-appropriate twist on the traditional recipe with its iced variation, a cardamom-spiked brew made with beans from Brooklyn import Parlor Coffee. Syrian native Wafa Ghreir dresses earthy fava beans with nutty tahini, chopped red onion and tomato, olive oil, lemon juice, and crumbled house-made feta. Shakshouka from Lodge Bread Co.
An egg graces tomato sauce seasoned with jalapeño and paprika in a skillet garnished with dill, parsley, and chives. Enjoy it all with the bakery’s famous crusty bread. Armenian lahmajun is a thin disc sporting a blend of ground beef, red pepper, onion, tomato, and parsley. Request a reheat to ensure a crackerlike crust. A smoky, sesame-studded flatbread is the cradle for molten white and mozzarella cheeses. Order your eggs cracked and dip the dough in the yolky sauce. Yael Tal grew up in Tel Aviv eating this flaky Yemeni flatbread. It’s griddled and served with a little cup of tomato sauce, a hard-boiled egg, and briny green olives. The mainstream American palate has historically been fine with porridge when it’s bolstered by butter and sugar, but add some mushrooms and fish sauce and it’s usually bye-bye breakfast buffet. 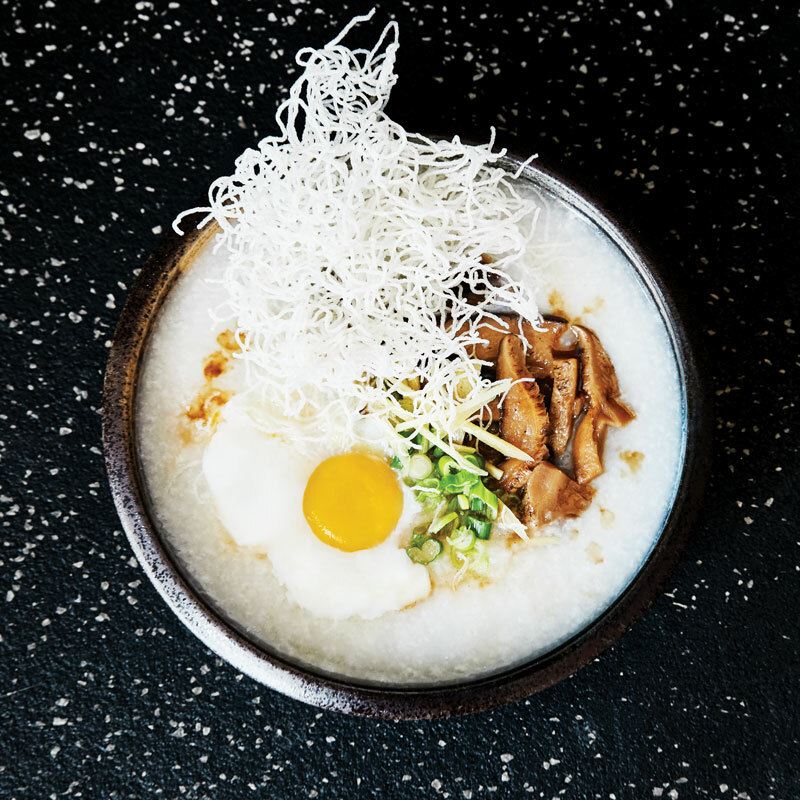 For Asian cultures, though, the rice porridge commonly known as congee (it goes by many names in different countries) is a satisfying canvas for your condiment creativity—think preserved egg, salted pork, and an array of salty, spicy, or fishy splashes. Long a staple in the San Gabriel Valley, these hearty bowls have finally begun appearing on menus everywhere, from Silver Lake’s Sqirl to West Hollywood’s Norah. At Otus Thai Kitchen on La Brea, you can enjoy Thai iced coffee with your “It’s a Joke” (Thai congee is called jok), which comes with fresh ginger and is topped with shiitakes, crispy rice noodles, and a soft-poached egg that melts into the porridge. Douse it with sriracha and say sayonara to IHOP. We can all agree on doughnuts. This Taiwanese standby is a simple fried, twisted cruller, typically served alongside a bowl of hot soy milk. Yes, pho, the popular Vietnamese noodle soup, can be a breakfast food. Adorn it with fresh herbs, hoisin, and chili sauce, and then go attack the day. Picture something between a crepe and a pancake—except crispy, flavored with Indian spices, and dressed with chutney and sambar instead of syrup. It’s the Filipino “Grand Slam”: a plate of garlic fried rice (sinangag) with dried meat (tapa), Filipino sausage (longganisa), and a pair of sunny-side-ups. This oxtail soup is a trusted Korean hangover cure. It comes with a zillion condiments, so you control how much heat your aching head can handle. A healthful breakfast was once half a grapefruit and a cup of tea. We’ve since embraced a philosophical shift (not to mention, like, food). The focus now is on giving our bodies nutritious sustenance as fuel, not depriving it of various foods. This is great for all sorts of reasons (carbs! fats! flavor! ), but mostly because it’s the kind of thinking that serious chefs can appreciate. Walter Manzke at République serves a chia seed pudding with coconut cream. Huckleberry’s Zoe Nathan swirls wilted greens with fiber-rich, slow-cooked beans. “I’m really interested in creating craveable, filling meals that have a healthy backbone,” says Sqirl’s Jessica Koslow, who built the city’s most famous breakfast bowl around wholesome brown rice and flavorful fermented bits. Not that you can’t have her hazelnut-chocolate-slathered brioche—just maybe save that for Sundays. 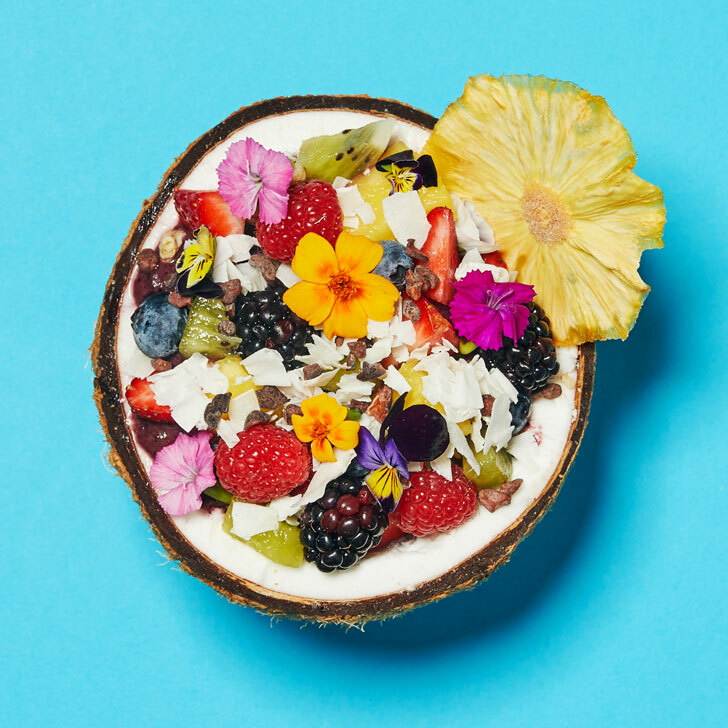 By the way, it’s pronounce A-Sah-EE: Acai bowls come packed with antioxidants and a heap of fro-yo-like toppings—so are they too good to be true? On its own, the Latin American “superfood” berry is low in sugar, but the final sorbet-like product is often blended with juice or bananas. The result can be a glycemic nightmare. (Jamba Juice’s 24-ounce acai bowl contains 96 grams of sugar; a serving of Ben & Jerry’s Chunky Monkey, 28.) “You can customize your bowl by taking out half the banana in the blended base,” says Bryan Leong of Amaze-bowls, who also suggests swapping the banana for avocado. “It still maintains that creamy texture but reduces the sugar.” Definitely skip that drizzle of honey or agave. You won’t miss it. Soaked chia seeds take on a tapioca texture. This raw-food joint offers warm chia porridge with almond milk and fruit. At our favorite macrobiotic minichain, eye-opening green tea powder makes for a verdant bowl of crunchy satisfaction served with seasonal fresh fruit and creamy coconut yogurt. Buckwheat and flax give a nutty bite to the plant-based hot spot’s gluten-free pancakes. Two big ones can come with fruit compote for the regimented, and maple syrup for the rest of us. You can go nice or naughty here (lo, the malva pudding). If the former is your goal, try this bowl, made with organic brown rice, a poached egg, and feta. In this protein powerhouse, a jumble of white beans, sausage, fennel, and baby kale is topped with a poached egg. Put an egg on anything and it becomes breakfast. That “anything” could be a bowl of rice or maybe (gasp!) sautéed greens. But for the thousands of us with guts of steel, it’s more likely going to be something fried and oozing and stuffed into another thing that’s buttery and flaky. 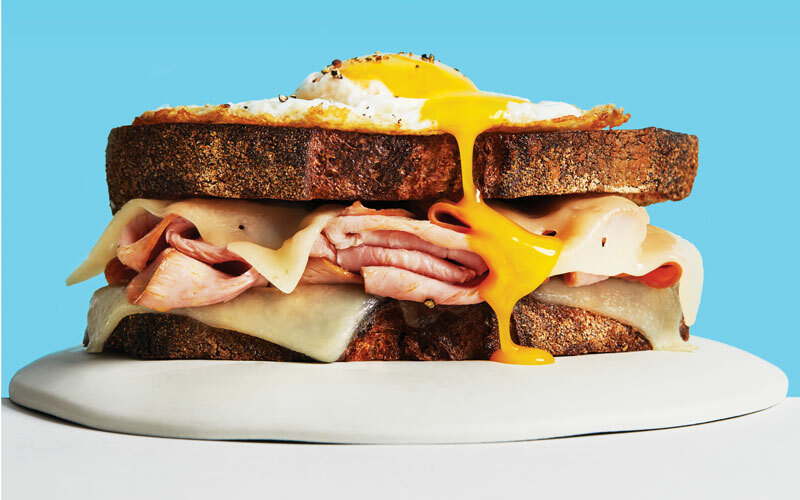 This is what you’ll find at Free Range, a truck and soon-to-be restaurant where over-the-top sandwiches challenge the definition of breakfast. They represent a new kind of garish morning belly bomb, one that’s not so much meant to start your day as end it—or at least help document your impressive gastrointestinal skills on social media. Snag a sandwich (and several napkins), flip the bird to all that harsh sunlight, and head back to bed. Speaking of biscuits: We prefer that all our morning baked goods be at least equal parts fat and flour. So why in the world would we opt for some English muffin or dry toast when we could build our breakfast sandwich around a golden, fluffy biscuit. Pann’s makes a credible classic, but here are three other flour-dusted destinations that really butter our biscuit. Kris Tominaga’s rich biscuits are life altering on their own, but we don’t mind the trio of spreads: creamy pimento cheese, sweet honey butter, and a dollop of seasonal jam. Palm-size biscuits come filled with layers of egg, cheese, and bacon at this small take-out window in Northeast L.A.
Imbued with sharp cheddar and applewood-smoked bacon, David LeFevre’s maximalist biscuits are the stuff of South Bay legend. Don’t neglect the whipped maple butter. Only the crazy trifecta of Jon Shook, Vinny Dotolo, and Ludo Lefebvre would crown custardy brioche with Salt & Straw vanilla ice cream. The outdoor restaurant serves an enormous country-fried steak with a couple of sunny-side up eggs, grilled onions, peppers, and perfectly piquant salsa. It’s impossible not to smile in the presence of a tire-size red velvet pancake with a swirl of sweet cream cheese icing and a shower of powdered sugar on top. Quick, eat this roast beef sandwich—topped with bacon, a fried egg, cheese sauce, and crunchy tots—before it gets all over you. The Duke would have loved this messy plate of tortillas stacked with fries, fried eggs, cheese, ranchero sauce, and sausage. 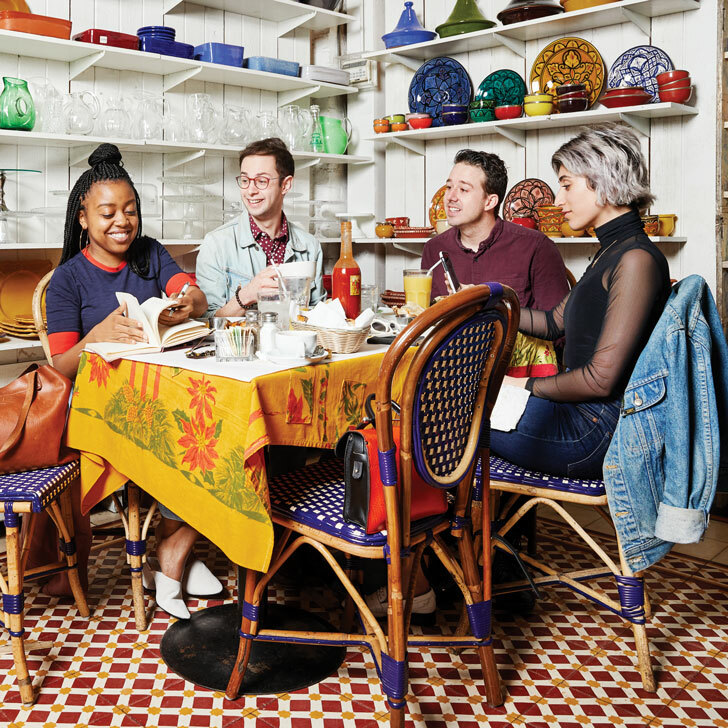 For this posse of young professionals—Quinta Brunson, Zach Kornfeld, Chris Reinacher, and Layla Halabian, and (you might recognize them from the Internet)—breakfast is serious business. They tend to frequent Café Midi and Little Doms, but there are plenty of other places in the city for a solid power breakfast. Arty Eastside professionals dig this stack of potatoes with house-made corned beef, charred green cabbage, mustard, and two poached eggs. This meat lover’s a.m. classic deserves a suit and tie: two slices of thick-cut, house-cured bacon, two pork sausage patties, and two eggs how you like ’em. Booyah. Type with one hand while the other holds this sammie, in which scrambled eggs and chorizo join Swiss on brioche. Strips of pastrami-cured gravlax curl alongside a soft-boiled egg, creamy labneh, pickled cucumber, and two crusty slices of Gjusta’s sprouted rye bread. Join the A-list in the atrium for a sourdough hunk heaped with soft-scrambled eggs, wild mushrooms, ham, spinach, and of course, hollandaise. With contributions from Lesley Bargar Suter, Josh Lurie, Noah Galuten, David Hochman, Julia Herbst, Garrett Snyder, Marielle Wakim, and Lesley Balla. Previous article13 Incredible Biscuits in L.A.